The cornea is the clear part of the eye’s protective covering that transmits light into the eye. The iris, that by the way determines the color of the eye, can modulate the size of the pupil. It thus determines the amount of light reaching the inner part of the eye. Light is focused onto the retina by the cornea, and to a lesser extent by the lens, which is located behind the iris. 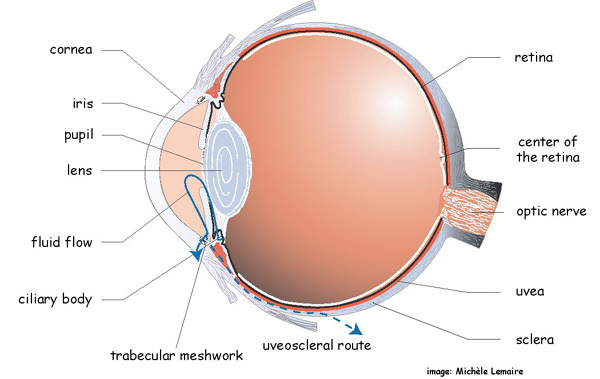 The retina contains two types of light-sensitive cells or photoreceptors. Cones are located in the central area of the retina and allow for sharp vision, whereas rods in the peripheral retina provide the visual field. All photoreceptors convey their information to ganglion cells that are also located in the retina. The latter cells are nerve cells with one very long fiber. All fibers assemble in the back of the eye to form the optic nerve that carries all visual information to the brain. The brain plays a crucial role in processing all received visual information into the images we see. The eye is filled with fluid that is under a certain amount of pressure so that the eye cannot easily be deformed. This inner eye fluid is constantly being replaced by fresh fluid from the ciliary body. Excess fluid can leave the eye via two routes. The principal one is the trabecular meshwork, a mesh-like system of drainage canals that surrounds the iris root over 360 degrees. Alternatively, fluid can drain via the less important uveoscleral route. This fluid is transported directly from the eye into veins where it is carried away with blood flow. It never appears at the eye’s surface and has nothing to do with tears. Eye pressure remains normal as long as the amount of fluid that is being produced in the eye equals that escaping from the eye.